Does Subtracting a Negative = A Postive? Tormented Soul can't block and is unblockable. Guardian of the Guildpact is both very hard to block and very hard to kill. Another wincon might be using an unblockable creature like Tormented Soul or Dauthi Marauder together with Phyresis , just to make sure you kill your opponent even if they can get life every turn too. The main issue is that all of these can be countered, but there's not much that can be done about that. I like the feel of this deck, very flavorful. I think Tormented Soul might be a good replacement for Prickly Boggart , but you might want to keep the Goblin? Dawn of Hope seems a very nice card for this deck, considering all the life gain. Also, I think Legion's Landing Flip is better than Call to the Feast or Queen's Commission . 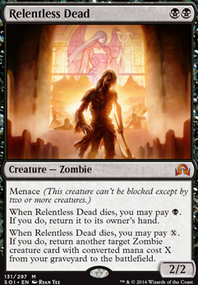 Hour of Reckoning is probably better for you than Wrath of God , since you can easily convoke it and you will be left with a lot of tokens. Regarding lands, I don't think balance is the problem as much as the number. Your mana curve isn't low enough for just 20 lands, and you even run three colors! Maybe one Swamp, one Mountain, and one Fetch Land like Terramorphic Expanse ? cool looking deck. Here are a few suggestions. 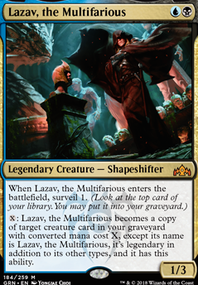 You can save a lot of space if you include just a single copy of one of the eldrazi titans (like Emrakul, the Aeons Torn or Kozilek, the Great Distortion ) that will shuffle your graveyard into your library for you. I would get rid of the Reliquary Tower s and Spell Book so that you can discard your graveyard shuffler to hand size. 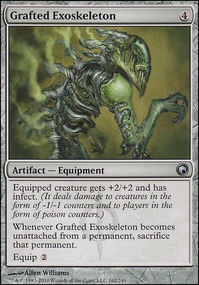 Another thing you might consider is using Invisible Stalker as your creature of choice instead of Tormented Soul . The hexproof is very important for making sure that your 4 mana investment of Whispering Madness wont just go to waste after a simple Fatal Push . 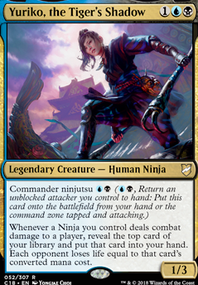 I also would cut the Aqueous Form since you've already got the "unblockable" text on your main creature. 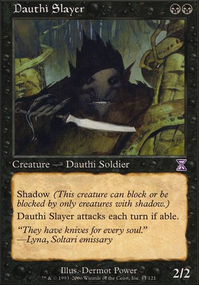 rather than spells that only cantrip (draw you a card and nothing else) you should consider things that give you a little more options: Serum Visions , Opt , Sleight of Hand . These do the same thing, but allow you to choose your outcome a little bit (though Sleight of Hand wont trigger anything that looks for "draw a card". Also, what happens if you don't draw the Whispering Madness ? you might consider more medium sized draw cards like Chart a Course that can get you to the good cards faster. Also you would want another win condition, like a Jace's Phantasm that can kill them with normal damage. 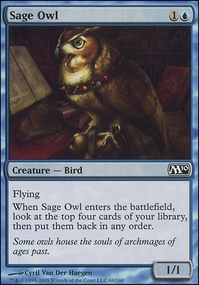 Lastly, a very good "draw a card" mill card you would want is Sphinx's Tutelage . This will ensure that they mill before you. Take out Tormented Soul for 3x Inkfathom Witch and another Triton Shorestalker. You have to choose the creature before the blockers are decleared, so having evasive creatures with haste will work better than trample, and maybe use creatures that if arent blocked will have some kind of effect or the other way araund. Tormented Soul, Prickly Boggart, Mardu Skullhunter, Dread Warlock, Dauthi Horror, Alley Grifters, Chittering Rats, Liliana's Specter. and probably add mass remuval and normal remuval. Shrivel, Pestilence, Ashes to Ashes, Evincar's Justice, Cannibalize, Snuff Out, Crypt Rats. sorry if all the cards i listed are black, im just more familiar with it. ZorrosRage nah, there's no need for it. Not sure what score you're talking about. Wandering Wolf and Tormented Soul are essentially both unblockable. Vault Skirge and Gurmag Swiftwing have flying which means they're pretty hard to block as well. Rancor is not an instant or sorcery so it would not trigger Wild Defiance (which is what this entire deck is focused around). All Rancor would do is slow me down, so it doesn't really have a place in this deck.